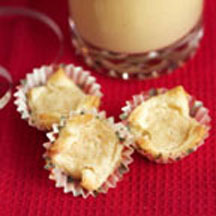 Gale Gand, Chicago pastry chef and Food Network star, uses fresh ground nutmeg, rather than powdered, to impart amazing flavor in her recipe for Eggnog Cream Cheese Cups. In large bowl, combine the flour and salt. Add the butter and mix the ingredients with an electric mixer on low speed until they form a sandy, crumbly mixture, about 1 minute. In a small bowl, whisk together the sour cream and egg yolk until very smooth. Add the sour cream and egg mixture to the flour mixture and mix until the dough comes together, about 30 seconds. The dough may feel a little dry. Form the dough into a disk, wrap in plastic wrap, and chill at least 4 hours or overnight. In a large bowl, beat cream cheese, egg, sugar, vanilla and nutmeg with an electric mixer until smooth; set aside filling. On a work surface thickly dusted with powdered sugar, roll out the chilled cookie dough to form a 12x18-inch rectangle, about 1/8-inch thick. Using the tip of a sharp knife or a pizza cutter, cut the dough into 2x2-inch squares. Place a teaspoon of the cream cheese filling in the center of each square. Grease the cups of a mini muffin pan. Gather the points of the dough square around the filling to make a cup, open at the top. Place the cookie directly into a mini muffin pan or place the cookie in a mini muffin paper liner and place the paper liner in the pan. Repeat with the remaining squares and refrigerate 30 minutes. Bake cookies until golden brown, about 15 minutes. Let cookies cool completely in the pan on a wire rack before removing. Store cookies in an airtight container in the refrigerator, for up to 1 week. Recipe and photograph provided courtesy of www.ButterIsBest.com; through ARAcontent.